Every six months Metro shakes things up with bus service changes meant to increase efficiency by modifying existing service based on a number of factors including ridership, budgetary concerns and public input. Although the most recent “shake-up” was little more than a month ago, Metro is already planning for proposed changes in June of this year. Why so soon? 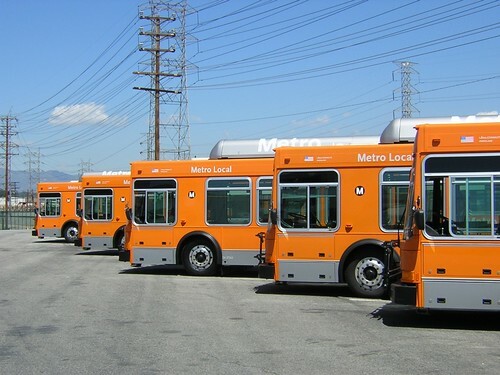 These shake-ups are labor intensive and require a small army of staff to prep and allocate resources for the modifications that affect Metro’s 200 bus lines. Before committing to any changes, Metro is holding public hearings to allow riders and other interested parties to chime in on the proposals. These meetings will be held in early February so that Metro has time to gather and consider public comment — and implement any alternatives derived from the comments — before moving forward. The proposed changes for June affect three service sectors: San Gabriel Valley, Westside-Central and San Fernando Valley. Most of the proposed changes involve modifying existing bus service, although there are plans to cancel one route (Line 31), as well as adding a new Metro Rapid Line from Downtown to Santa Monica via Venice Boulevard. The full list of proposed changes as well as dates and locations for the public hearings can be found after the jump. Line 180/181– Hollywood-Glendale-Pasadena via Colorado Blvd. & Los Feliz Blvd. – Consider modifying route between the communities of Glendale and Los Feliz to serve the Silver Lake area. Line 287 – El Monte-Montebello Mall-East Los Angeles College-Indiana Station. Restructure route to serve 1st Street from Atlantic Blvd./Cesar Chavez Ave. to 1st Street/Indiana Street due to proposed discontinuation of Line 31 service east of Indiana Street. Line 30/31– Pico/Rimpau-Monterey Park via Pico Blvd. & East 1st Street: Cancel route 31. Line 287 will assume the portion of service currently operated by route 31 from Collegian Ave./Cesar E Chavez Ave. to 1st/Indiana streets. Line 33/333– Downtown Los Angeles-Santa Monica via Venice Blvd. Replace service on Limited-stop Line 333 with new Metro Rapid Line 733. Line 217– Vermont/Sunset Station-Fairfax/Washington via Fairfax Ave. and Hollywood Blvd. Consider implementation of short line trips at Hollywood/Vine Station. Line 733– Downtown Los Angeles-Santa Monica via Venice Blvd. Rapid. Implement Metro Rapid bus service on Venice Blvd. from Patsaouras Transit Plaza to Santa Monica. Line 96– Downtown Los Angeles-Sherman Oaks via Riverside Drive, LA Zoo. Make permanent minor reroute from Riverside Drive to Glendale Blvd. between Fletcher Drive and Glendale Blvd. in Silver Lake. Line 166/364– Chatsworth Station-Sun Valley via Nordhoff Street, Osborne Street Local/Limited. Minor reroute from Nordhoff Street via Reseda Blvd. to proposed transit center at Cal State Northridge near Plummer Street and Darby Ave.
Line 167– Chatsworth Station-Studio City via Plummer Street, Coldwater Canyon Blvd. Minor reroute from Plummer Street to proposed transit center at Cal State Northridge near Darby Ave.
Line 168– Chatsworth Station-Pacoima via Lassen & Paxton streets. Minor reroute from Lassen Street via Reseda Blvd. to proposed transit center at Cal State Northridge near Plummer Street and Darby Ave.
Line 240– Northridge-Universal City Station via Reseda Blvd. and Ventura Blvd. (Branch route of Line 150) Minor reroute from Reseda Blvd. to proposed transit center at Cal State Northridge near Plummer Street and Darby Ave.
Line 741– Northridge-Tarzana via Reseda Blvd. Rapid. Extend route to Universal City Station via Ventura Blvd. Minor reroute from Reseda Blvd. to proposed transit center at Cal State Northridge near Plummer Street and Darby Ave. Route to terminate at Cal State Northridge or continue to existing terminal at Reseda Blvd. and Devonshire Blvd. Line 750– Warner Center-Universal City Station via Ventura Blvd. Rapid. Reduce weekday peak service and reallocate resources to Line 741. Line 902– Pacoima-North Hollywood Station via Van Nuys Blvd. and Burbank Blvd. Local/Limited. Make permanent new demonstration line and implement new midday service. February 3, 2010 at 6:30 p.m.
February 8, 2010 at 6 p.m.
February 10, 2010 at 5 p.m.